300 hundred year old farmhouse, restored to a high standard, all bedrooms ensuite. Private pool heated with solar panels. House and garden designed for the safety of babies and toddlers. Lots of lakes in the area with sand beaches and watersport activities (nearest beach 5 minutes drive). Fantastic walks and bike rides direct from the house. Other nearby activities in the area include golf, fishing, riding, velo rail and canoeing. FutureScope theme park 1 hour drive. Wonderful restaurants and bars to explore in the region. 5 minutes from town with large supermarket and all amenities. 30 mins from Limoges airport. The house is also available during the winter months (ie, Christmas) and has a wood burner and central heating. I am retired and have lived in France for sometime. I live on the borders of depts. 16 and 87 (Charente and Haute-vienne) which is very central to all areas and facilities. I have a lovely farmhouse which is available for holiday rent. It's a fantastic location and I have family here.The Countryside is really beautiful, with lots of place of interest, restaurants and bars to visit. all within easy reach of my farmhouse. Peace and quiet while being central to all amenities. 4 x en-suite bathrooms. Downstairs toilet. Our 7 day holiday at this farmhouse in Chabrac, Charente, France was great. The property is in a very rural area and is peaceful with cows in an adjourning field - the came to visit us to the delight of my grandchildren, in fact for all of us. The pool whilst not big but more than substantial for us. The property is big with ample room and all bedrooms have en suites that is a big asset. All facilities are good and lovely to dine out side in the lovely weather. The communications with Val was very good and her son Rob, who met us on arrival, was so helpful, nothing too much trouble for him. 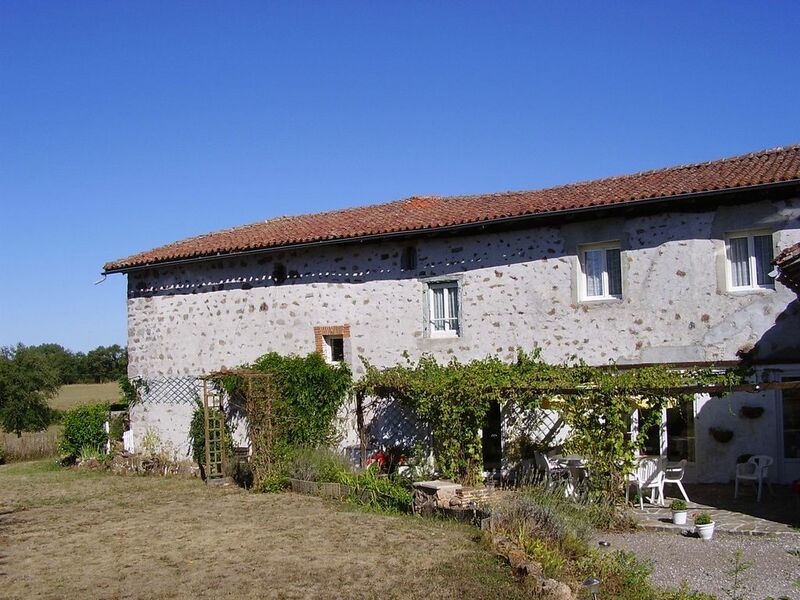 A very nice holiday in a lovely old farmhouse in a great location. Thank you Val and Rob. I'm so pleased you enjoyed your holiday and that you found the house to your satisfaction. You were lovely guest, and left the house spotless. Hope to see you next year. This a very well equipped house for all the family. Spacious with plenty of room in a beautiful location. A quiet rural setting yet close to the main village and large supermarket. Lots of exciting and interesting places to visit nearby and the house has plenty of leaflets and guidance of where to spend a day. The pool is perfect and plenty big enough to cool you down on the hot days. Rob the owner is close at hand if there are any problems and nothing is too much trouble. Only 30 mins or so from Limoges airport so not too much of a journey to the house. A car is a must as rural location. Thoroughly recommend for a family holiday whether it's for a pure chill out or active with the kids. Here in the Charente there are a lot of lakes that have man-made beaches with bars and restaurants. The house is 30 minutes from Limoges airport, 40 minutes from Angouleme airport. Driving distance from Calais is approx. 8 hours. Driving distance from Brittany ports approx. 6 hours. The town of Chabanais is 5 kilometers from the house. St Junien is 12 kilometers. Limoges is 40 kilometers. The house is in an area known as Charente-Limousin, which has one of the mildest climates in France. Temperatures are pleasant from early June to early October. Booking Notes: Terms and conditions form is included with booking form. Payment schedule; 25% of total cost as deposit booking 75%of total cost 8 weeks before arrival Changeover Day: Saturday but can be flexible, depending on bookings.